Lacoste Live! Tipped Short Sleeve Polo Shirt. Red, White And Navy BlueTipped Collar And Sleeves. Colour: Green. Size: 7 / Large. Used But In Great Condition. Art Number: F6191. Faint Mark On Lower Back As Pictured. LACOSTE POLO SHIRT. DEVANLAY - 100% AUTHENTIC. SIZE - 6 / XL, PIT TO PIT 23". COLOUR - GREEN. LACOSTE POLO SHIRT. DEVANLAY - 100% AUTHENTIC. SIZE - 6 / XL, PIT TO PIT 23". COLOUR - BLUE. Mens Lacoste Burgundy Polo Shirt Tshirt Size 3 Small. Condition is Used. Dispatched with Royal Mail 2nd Class Signed For. 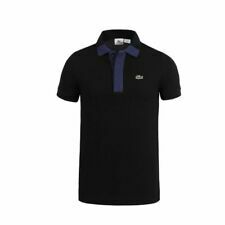 XL Lacoste Mens Polo T-shirt SIZE 7. Condition is Used. Dispatched with Royal Mail 1st Class. Size: 8 / 3XL. Solid Short Sleeve Polo Shirt. Colour: Orange. Used But In Great Condition. Art Number: F5191. SELECT 'READ MORE' FOR PHOTOS & FULL ITEM DETAILS. Lacoste polo shirt size 7, would fit a 2XL, measures 26 inches across the chest. In a navy colour (best indication of this is the darker pictures) and it has the Lacoste croc on the chest. This polo shirt has been worn, but comes in very good, clean, used condition and from a smoke and pet free home. PayPal only please and happy bidding! SIZE: SMALL /// '3' /// Pit to pit: 19". LACOSTE "DEVANLAY" SLIM FIT POLO SHIRT. GOOD CONDITION. Sorry, i don`t allow collections. LACOSTE SPORT POLO SHIRT. DEVANLAY - 100% AUTHENTIC. SIZE - 3 / SMALL, PIT TO PIT 19". Lacoste Polo Shirt Size 9 "Excellent"
Lacoste Polo Shirt. Pit To Pit 28" Length 29". Nice Clean Condition. Very Light Wear. Condition;. 2 Button Fastening. LACOSTE LONG SLEEVED POLO SHIRT. DEVANLAY - 100% AUTHENTIC. SIZE - 5 / LARGE, PIT TO PIT 22". COLOUR - BLACK. Lacoste Live! Tipped Short Sleeve Polo Shirt. Orange, White And Sky BlueTipped Collar And Sleeves. Size: 7 / XL. Couple Of Small Holes On Left Side And Faint Mark On Right Sleeve As Pictured. Colour: Blue. LACOSTE POLO SHIRT. DEVANLAY - 100% AUTHENTIC. COLOUR - BLUE / GREY. SIZE - 6 / XL, PIT TO PIT 23". LACOSTE SPORT POLO SHIRT, DEVANLAY - 100% AUTHENTIC. SIZE - 8 / XXXL PIT TO PIT 26". COLOUR - BLUE. Lacoste Polo Shirt Size 3. Condition is used but plenty of wear left in it. Great brand. Real bargain!!! Selling lots of men’s designer stuff with shirts to be added soon! Lacoste Polo Shirt. Size 5. Blue. Lacoste Polo Shirt. Size 5. Blue. This is a small fit, chest measures 38 inches. Condition is Used. Dispatched with Royal Mail 1st Class. Men's Red size 6 /large Lacoste Polo Shirt New. Dispatched with Royal Mail 1st Class. 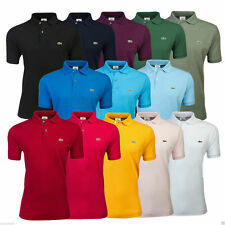 LACOSTE SPORT POLO SHIRT, DEVANLAY - 100% AUTHENTIC. SIZE - 7 / XXL PIT TO PIT 24. CONDITION - EXCELLENT USED CONDITION. 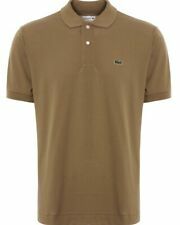 Lacoste short sleeved polo shirt in a size 3XL. Get Supersized Images & Free Image Hosting. Condition is Used. Very slight signs of wear on collar as you can see in the pictures and generally in very good condition. LACOSTE SPORT LONG SLEEVEDPOLO SHIRT. DEVANLAY - 100% AUTHENTIC. COLOUR - GREY. SIZE - 5 / LARGE, PIT TO PIT 22". Lacoste Polo Shirt size us L. Condition is Used but in good condition. Dispatched with Royal Mail 1st Class. Mens Lacoste Polo Shirt Cotton Classic Fit Short Sleeve Size 5 / Large. Condition is Used. Dispatched with Royal Mail 2nd Class. MENS LACOSTE SPORT POLO SHIRT SIZE 4 MEDIUM. FAB CONDITION. Great blue colour only worn once. From a smoke free home. Dispatched with Royal Mail 2nd Class signed for. Lacoste Polo Shirt good condition. Not worn that many times. Condition is Used. Dispatched with Royal Mail 1st Class.